‘Jews Out’ graffiti fails to win demonstration of support from Peres. Residents of northern Israel were disturbed this week to find that around 20 bus stops had been sprayed with anti-Jewish slogans. The graffiti followed the Knesset’s decision to pass a law regarding Bedouin settlement in the Negev. Arab MKs vehemently opposed the plan, which will legalize many pirate Bedouin settlements in the region, due to the fact that it will require some of those who have no proof of ownership of their land to move to alternate land provided by the government. The Arab MKs view this as a forced population transfer. Samaria Residents’ Council head Benny Katzover said the Arab MKs’ bitter criticism in Knesset was directly linked to the anti-Jewish graffiti. “This is a direct continuation of the Arab MKs’ incitement… There is no doubt that the Arab MKs are adding fuel to the fire and causing violent acts like this,” he said. Council director-general Keizler Sagi wondered why the Arab “price tag” had gone widely ignored by the media and by Israeli leaders, just two weeks after similar graffiti in the Arab Israeli town of Abu Ghosh earned condemnation from a variety of political figures, including President Shimon Peres. 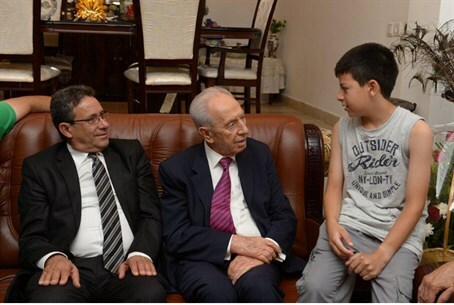 “I call for the President, Mr. Shimon Peres, to visit Carmiel and tell the residents there that what was done at their bus stops was a disgrace, and to ask the police to catch whoever wrote this hateful graffiti, as he did in Abu Ghosh,” Sagi said.